Suzuki is running “Sled”, a Super Bowl commercial featuring an Innuit driver who’s traded his sled in for a Kizashi. 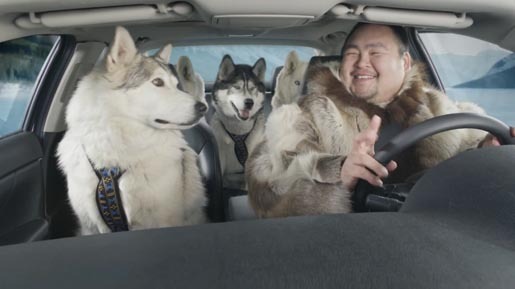 An Inuit man cruises through majestic arctic terrain in a new Kizashi with his sled dogs along for the ride, listening to the 50 Cent track Moving On Up. As he arrives back home his wife waits outside the igloo with a “Please explain” line. The Sled ad was developed at Siltanen & Partners, Los Angeles, by chief creative officer Rob Siltanen, creative director Joe Hemp, group account director Doug Ryan, management supervisor Wendy Nicolle, director of product and marketing planning John Morel, broadcast producer Anne Kurtzman, project manager Denisse Rios and business affairs manager Miiko Martin. Filming was shot by director Jim Zoolalian via Boxer Films, Los Angeles, with executive producer Beth George, head of production John Quinn, and editor Ian Arthur. Filming was shot in one day at Canada’s frozen Spray Lake, near Canmore, Alberta and stars two actors from small Inuit villages in Alaska.